The National Bed Federation (NBF) has this week posted a goal to divert 75% of new mattress sales away from landfill by 2028. The decision, supported by a technical report produced by Oakdene Hollins, is a very welcome one. In an earlier report we estimated that, in 2014, 16% of end-of-life mattresses were recycled, equating to around 950,000 mattresses. In the most recent report, our evidence base suggests this has increased to 1.4 million mattresses which, although being a major improvement, only pushes the recycling rate up to 24% (assuming 2014 sales figures). While this rate is higher than expected, it still leaves a lot to be desired as we have found that 57% of mattress components are currently recyclable (as shown in Figure 1). For all components, 100% can be diverted from landfill through methods of recycling, reuse and energy-from-waste. This shows that the NBF's target is rational and achievable. Figure 1: This graphic depicts the overall end-use of mattresses processed by major recyclers in the UK. 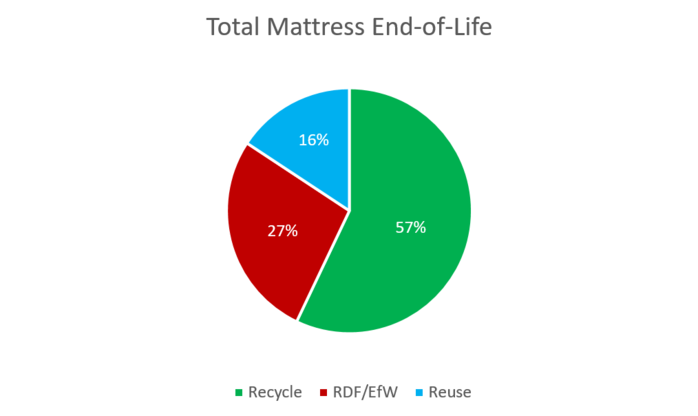 It is based on a breakdown of the end fates of individual mattress components as described in the NBF's Mattress Component Recycling report. Please note: In the above Figure it is assumed that the natural fibres in mattresses are predominantly used in RDF or incinerated with energy recovery. Our report for the NBF suggested setting targets to stimulate action from manufacturers and recyclers alike. We also recommended supporting mattress component recyclers to find sustainable and cost-effective recycling methods. Our third, and arguably most important, point was to encourage the NBF's movement towards the circular economy - because - as CE experts - we are forever championing extender producer responsibility schemes and stewardship schemes that enable a shift to CE thinking.